I wanted to hurl my screaming alarm clock into an abyss. The warmth of my cozy covers and the safety of sleep beckoned my heart to stay, linger and forget what lay ahead of me that day. On that afternoon, I would sing for the funeral of a precious eighteen year-old family friend who had died in a tragic car accident. She was a girl who lived life to enjoy life. She babysat my kids and would often catch a ride home from church with us. She always had a spring in her step, a hug for a child, a kind word on her lips, and a sweet smile on her face. To know Macie was to love Macie. So, as you can imagine, my heart ached intensely when she died. The sorrow messed with me. Everything about her death seemed wrong. She was so young. So vibrant. So loved. I yearned to turn back the hands of time and somehow alter the course of Macie’s demise. I wanted her to magically appear at the service and tell us that it was all just a big misunderstanding. That she was fine! I wanted her to be fine. I wanted her to be alive. Macie only lived on this earth for eighteen short years, but she added life to her years when she surrendered her heart to Jesus Christ a year before her death. I imagine that she now skips along streets of gold, worships God whole-heartedly, and loves on the two babies of mine that are in heaven. She always loved taking care of babies. The Spirit of God and the confidence of Macie’s salvation consoled me, yet I still had to choose to praise God through my grief. In the sadness, I had to choose to bless the Lord for His plan. Even though His plan didn’t line up with my expectations. Even though those plans left many hearts heavy with ache. God’s grace enabled me to see rays of light in the dark loss because Macie had professed her faith in Christ and was prepared to meet Him when she breathed her final breath. Adding life to your years is all about Jesus. We can all know hope and peace in Christ. 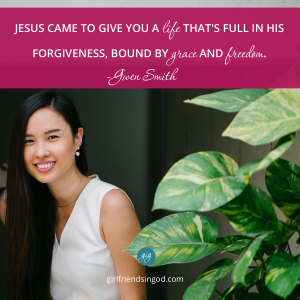 “In Him was life, and that life was the light of men.” (John 1:4) Jesus came to give you a life that’s full in His forgiveness, bound by grace and freedom. Do you know that kind of forgiveness? Let’s live today in the fullness of Jesus… in response to His grace and goodness. Let’s determine to live each day filled with purpose, praise and thankfulness as we worship God and point others to Him in love. It was a sad day when we said goodbye to Macie. After leaving the graveside, I went home, hugged on my children and loved on my husband a bit more than normal. Her death reminded me just how precious life is and how important it is to add life to my years. It’s important for you too. Live in the moment. Love your people well. God has a plan for your now. Dear Lord, Thank You for offering eternal life through the perfect and complete sacrifice of Jesus. Thank you for replacing my human hopelessness with your divine hope. Please help me look past the distractions and disappointments of this world and to live each day to the fullest in You. Is there someone whom you have offended, won’t forgive, are holding a grudge against or owe an apology to? Contact them today and attempt to make peace before the sun goes down. Hug your loved ones. Say, “I love you.” Focus on what really matters. “Rejoice with those who rejoice; mourn with those who mourn.” (Romans 12:15) Reach out to someone that is hurting. Pray for her. Post a prayer of response or share your thoughts on the wall of my blog. Thank you for the reminder of the promises of God! I am hurting because of a family issue. I want to give God the glory for working this through – my heart HURTS! Oh Lord let me praise you in the storm!